The commanding officer of the INS Vikramditya has had a distinguished career in the Indian Navy. Bringing home the country’s flagship aircraft carrier stands out among his highest achievements. December 4, India’s Navy Day is a doubly festive occasion for the crew of the INS Vikramaditya, with the state of the art aircraft carrier now part of the Indian Navy and bound for Karwar . 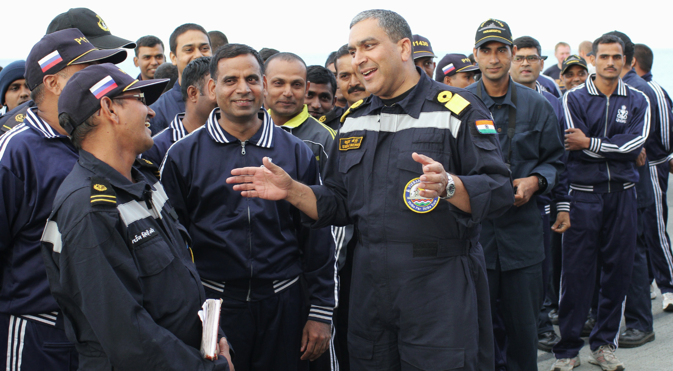 Few people are as delighted as the ship’s commanding officer Commodore Suraj Berry. Since taking over the vessel on November 16, 2013, Commodore Berry has shouldered a large responsibility. He is aware of his obligations, believes in his team, and is ready to tap his reserves of experience. Commodore Berry has 26 years of naval service under his belt. He recalls how he was born into a military family, studied at a naval academy, and was joined the Indian Navy in 1987. Although he considered himself an expert in artillery and rocket launchers, he was assigned other duties. His professional biography includes service aboard the Subhadra coastal patrol vessel, the Pralaya missile boat, and the Ranjit, Ranvir, and Delhi destroyers. Members of the Russian delivery team that prepared and tested the seaworthiness of the vessel spent more than 122 days with the Indian crew on the White and Barents seas. They noted the qualities of Suraj Berry's leadership — his high work capacity, personal organization, erudition, and exacting standards of himself and his subordinates. During the tests, the aircraft carrier covered 1700 miles under Commodore Berry's command. Moreover, during the period 2012-2013, 875 Indian officers and sailors gained practical experience aboard the Vikramaditya. They solved many important and difficult tasks. But perhaps the most striking event was the first landing of a MiG-29 KUB on the deck of the carrier. Commodore Berry and his subordinates remember well the day and the hour — July 28, 2012, 0930 Moscow time — when MiG test pilots Mikhail Belyaev and Hero of Russia Nikolai Diorditsa touched down into the arresting gear of the Vikramaditya with meticulous precision. The mood was one of joy and elation, followed by a debriefing and clearance for takeoff. The fighter taxied to the starting position, hit the afterburner switch, and after several seconds of acceleration tore away from the ramp. After multiple passes over the ship, the pilots performed another beautifully soft landing. The day before, says the commander, the entire Indian crew had gathered in the hangar of the Vikramaditya for a prayer meeting. They prayed that the launch at sea and first landing would go well. “And today we are happy,” Berry said. Noting the achievements of the shipbuilders of Sevmash, the experts of Nevsky Design Bureau, and the pilots of RAC MiG, the commander of the Indian crew individually thanked his colleagues: senior officers of the Russian Navy First Rank Captains Alexander Shevchenko and Igor Ryabko, who were always close by at the most crucial moments of the tests to share their experience and help master the controls of this unfamiliar (for India) vessel. During the two years he spent in northern Russia, Suraj Berry, in his own words, found many new friends and made the acquaintance of real professionals.